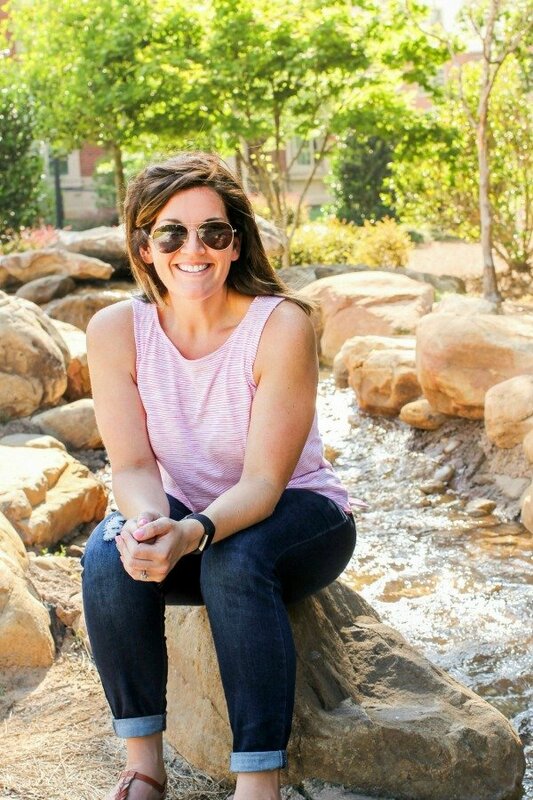 January 25, 2019 By Allyson 13 Comments This post may contain affiliate links. Read my disclosure policy. 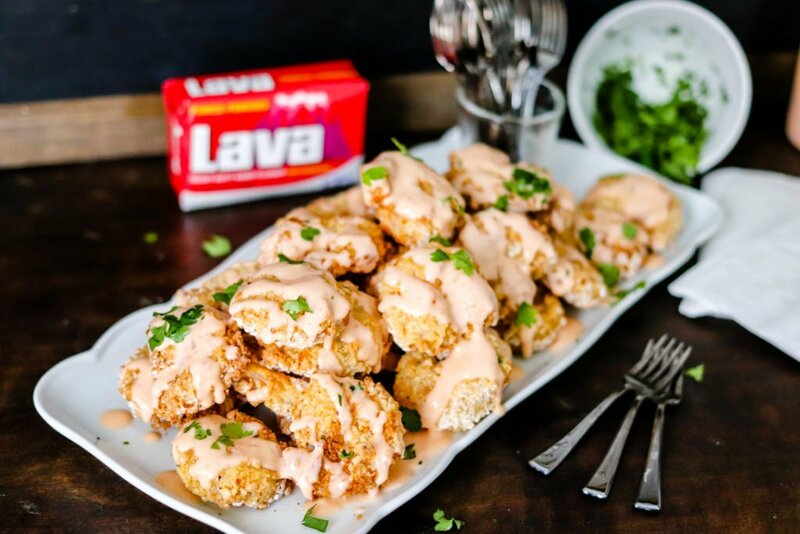 Air Fryer Bang Bang Shrimp are topped with a healthier version of the classic delicious sweet and spicy Bang Bang Sauce. They’re the perfect lightened up appetizer or meal! 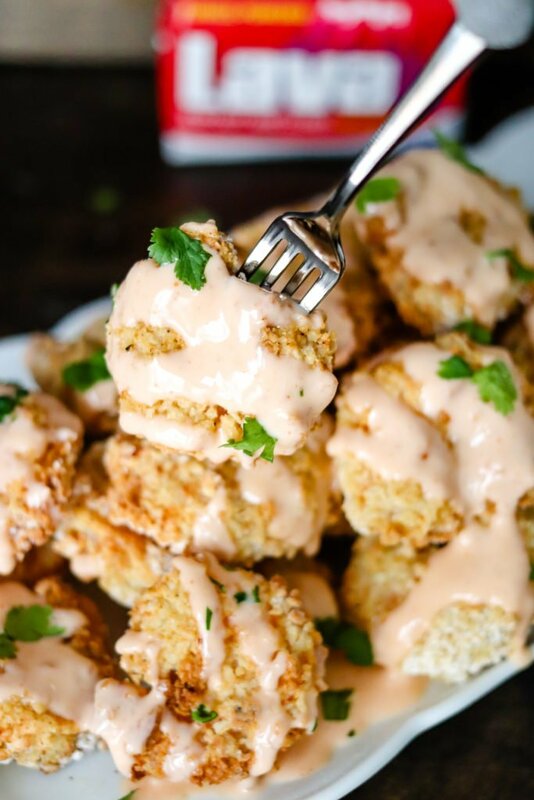 Air Fryer Bang Bang Shrimp is a healthier take on the popular fried bang bang shrimp recipe! Bang Bang Sauce is such a delicious sauce; sweet and then a punch of spice, it’s perfect on pretty much everything! 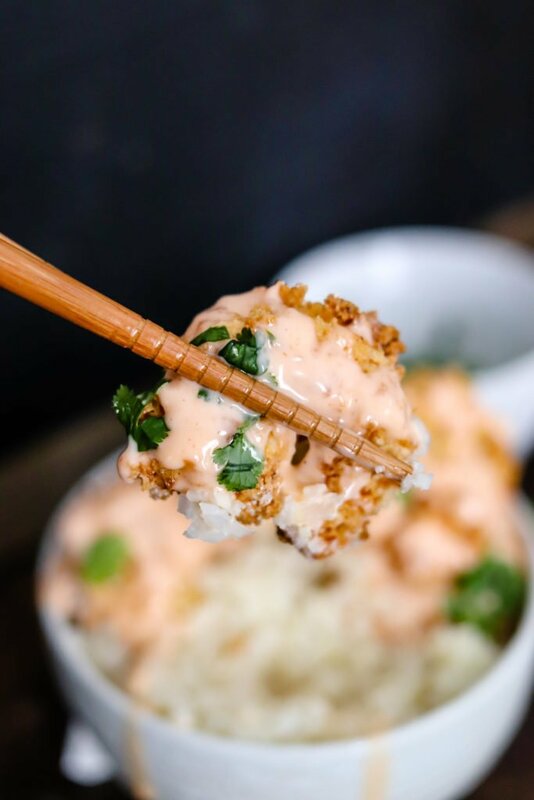 If you haven’t made my Bang Bang Chicken (in the instant pot), or my Bang Bang Shrimp Egg Rolls you need to give them a try! Today’s post is sponsored by Lava® Soap, but as always, all opinions are my own. Do you have an Air Fryer? I am in LOVE with mine because it makes “frying” food healthier! It does a great job crisping food and doesn’t use any of the greasy oil! Air Fryer Bang Bang Shrimp is much healthier than the fried alternative because you don’t have to deep fry them. The prep is pretty much the same because you still have to coat the shrimp with flour, egg and then the crumb mixture, but then you just pop them in the air fryer. The only thing I don’t love about coating various foods to “fry” is how dirty my hands get! By the end of coating the shrimp, my hands are covered in flour, eggs, bread crumbs and all kinds of spices! This is where Lava® Soap comes in! It’s so versatile and great for getting grime, grease, paint, ink, glue and much more off of your hands. It’s very easy, and pretty much uses the same method as frying, but using the air fryer allows the oil to be left out! Prepare a pound of large shrimp: make sure they are deveined with tails and shells are removed. They should also be defrosted if frozen (follow package directions ). You can also use fresh shrimp. Setup all of the ingredients: it’s easiest to make the air fryer bang bang shrimp in somewhat of an assembly line. Add the shrimp to a plastic bag with the flour and toss to coat. Tap off any excess flour before the next step. Add a few of the shrimp to the egg wash and toss to coat completely. Add the shrimp to the breadcrumb mixture and press the coating into the shrimp, being sure it sticks. Repeat for all of the shrimp. Wash hands with Lava® Soap to remove all of the grime from your hands! I love keeping a bar near my sink because it makes cleanup so quick and easy! I’ve already shared with you how it’s the only soap that will take off jalapeno residue (trust me, you do not want anything jalapeno in your eyes! ), sweet potato orange ‘stain’, and cooking oil! 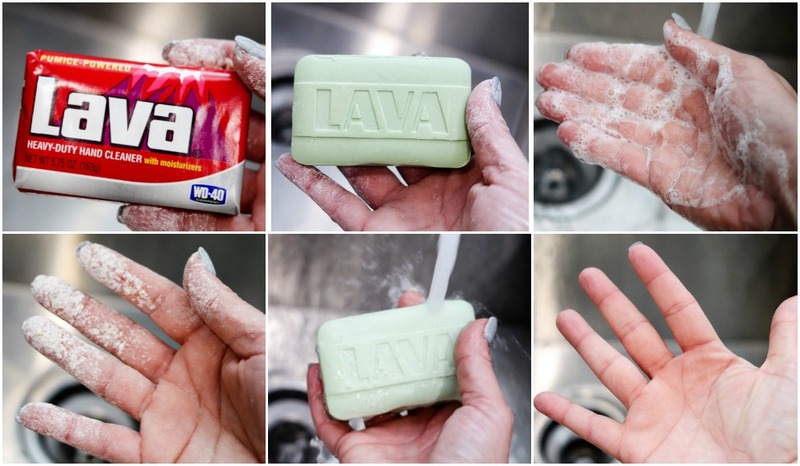 We keep bars of Lava® Soap all around our house, but especially in the kitchen and in our mudroom where I wash my hands after doing dirty work around the house and garage. I love it! You can buy Lava Soap at a Walmart near you. You can also print off a coupon to use on your next shopping trip: COUPON HERE. Be sure to follow Lava Soap on Facebook for even more cooking, DIY and hand cleaning tips. Place the shrimp into the air fryer, adding only as many as will fit in a single layer. Give a quick spray of olive oil over the tops of the shrimp, then close the air fryer. Set the temperature at 400 degrees and the timer to 5 minutes. When the time is up, carefully flip the shrimp over, spray with olive oil, then close and set again to 400 degrees and set the timer for 3 minutes. Remove when the time is up, then repeat until the rest of the shrimp are cooked. Bang bang sauce is a sweet and spicy sauce that tastes great on EVERYTHING! The traditional version is made with full fat mayonnaise, but for this recipe I’ve lightened the sauce up. Since we are using the air fryer, and by doing so, saving a ton of fat and calories by not deep frying, I figured it would be nice to have a healthier sauce as well. The difference is Greek yogurt is used instead of using all mayonnaise! To make: Add all of the sauce ingredients into a bowl or jar (scroll down for amounts), then mix until completely combined. Place in the fridge until ready to use! 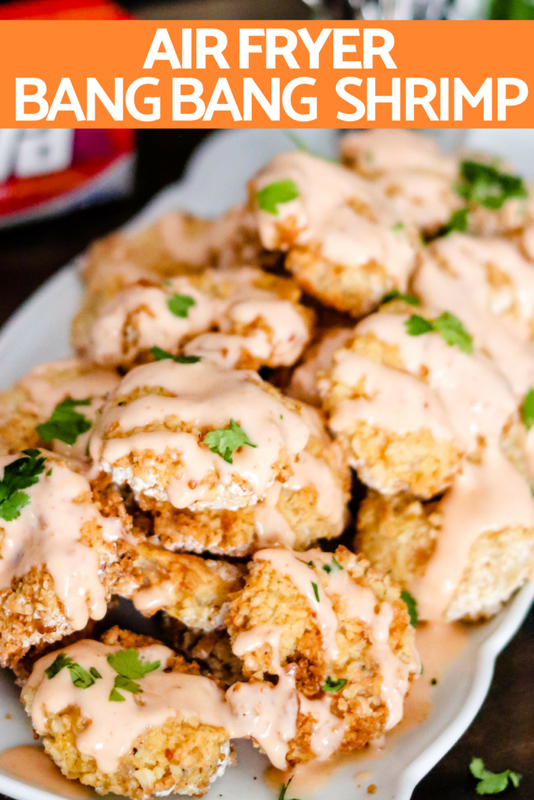 Air Fryer Bang Bang Shrimp makes a perfect party appetizer! Serve it on a tray (add the sauce right before serving), with small forks or toothpicks on the side! Top with green onions or cilantro! Bang Bang Shrimp also makes a great meal! Serve it over rice or cauliflower rice as a lower carb option and dig in! Top the shrimp with the sauce (add extra to the rice- YUM), then garnish with green onions and some cabbage slaw! 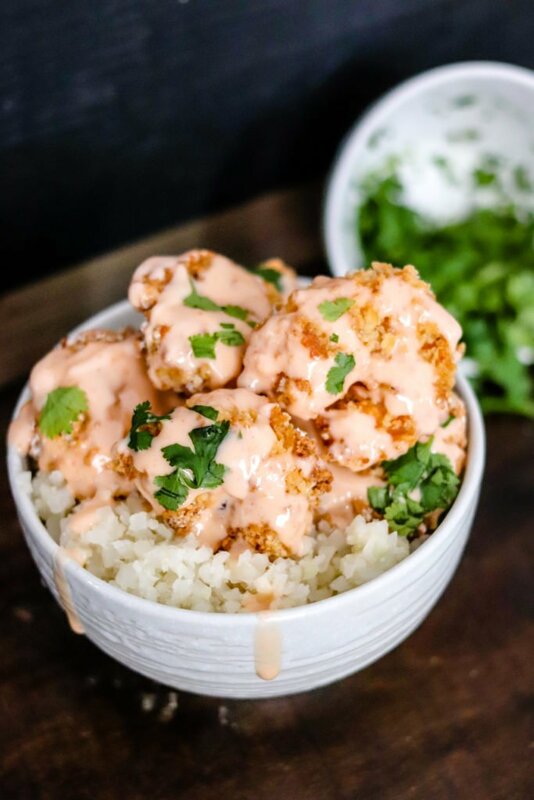 Air Fryer Bang Bang Shrimp would be GREAT in Bang Bang Shrimp Tacos! 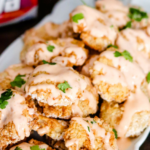 You can find my popular version of the recipe here, just substitute the deep-fried shrimp with the air fryer bang bang shrimp! Add Air Fryer Bang Bang Shrimp into a quesadilla for lunch or the another great party appetizer option! Cheesy Garlic Breadsticks will leave everyone’s mouthwatering. Made on fresh dough and loaded with cheese, this is a winner! Baked avocado fries are creamy, crunchy, and healthy without any oily mess! They’re the perfect health conscious snack, with only a handful of ingredients! Instant Pot Garlic Hummus has only a handful of ingredients; Save money and know exactly what’s in your food with this recipe! Jalapeño Popper Cheese Bread is the perfect blend of spice and creaminess. This appetizer will not last long at your next party! Setup all of the ingredients; it's easiest to make the air fryer bang bang shrimp in somewhat of an assembly line. ￼Place flour into a large Ziploc bag. Place eggs and water into a small bowl and beat together. Place cornstarch, panko breadcrumbs, salt, pepper, garlic powder, and paprika in a shallow container and mix well. Add the shrimp to the plastic bag with the flour and toss to coat. Tap off any excess flour off before the next step. Add a few shrimp to the egg wash, and toss to coat completely. Add the shrimp to the breadcrumb mixture, toss and press the coating into the shrimp, being sure it sticks. Repeat for all of the shrimp. ￼Wash hands with Lava® Soap to remove all of the grime from your hands! Place the shrimp into the air fryer, adding only as many as will fit in a single layer. Give a quick spray of olive oil over the tops of the shrimp, then close the air fryer. Set the temperature at 400 degrees and the timer to 5 minutes. When the time is up, carefully flip the shrimp over, spray with olive oil, then close and set again to 400 degrees and set the timer for 3 minutes. In a small bowl, add Greek yogurt, mayonnaise, sugar, sriracha, and rice vinegar. Whisk to combine; place in fridge until ready to serve. Place cooked bang bang shrimp on a tray, then top with bang bang sauce right before serving. Add chopped green onion or chopped cilantro over the top of the bang bang shrimp and enjoy! This is awesome! My husband loved it! My husband really loved it!! Such a huge hit! These look delicious! Can’t wait to make this for my family. This dish was a huge hit here! Love that I can make easy shrimp dinner in my air fryer! I am so glad y’all loved it! I love using my air fryer and lava soap to cleanup!! Looks beyond delicious and love that it was made with an air fryer!! I love how crispy these shrimps look! I should definitely try this soon! Love the idea of making these in the air fryer! And that sauce looks delicious! This is the best recipe! I have made it for my family probably 10 times or more. My husband says he would like to have it at least once per week. Great recipe! Thank you! I am so glad y’all love it so much!!! Making these in the air fryer was so easy. Thanks for this amazing recipe! I love the option to make this shrimp lighter by using the air fryer! And that sauce is amazing!